Founded in 1908, Edinburgh based fund manager Baillie Gifford is now one of the UK’s largest active investment management firms with funds under management exceeding £179 billion. Unlike most large-scale investment firms, who seek to bolster their sales and profits through mergers and acquisitions, Baillie Gifford has remained completely independent. They believe this approach has enabled them to keep a business structure that is more focused on their clients and their investments. 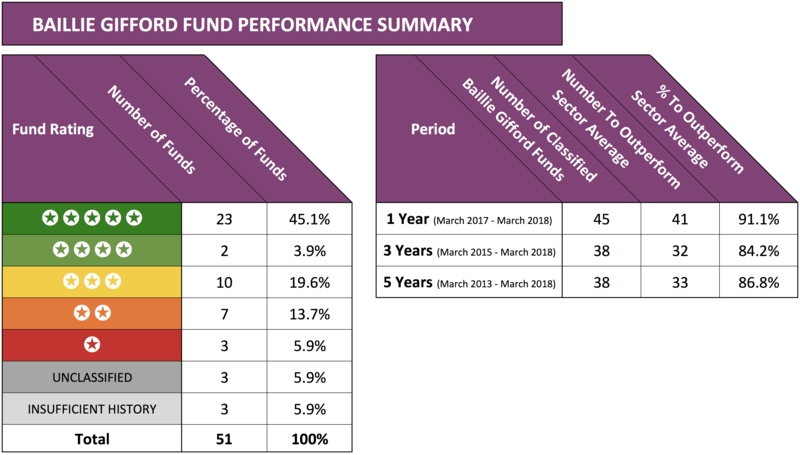 Within the latest analysis report, we analysed the recent 1, 3 & 5 year performance and sector ranking for all 52 Baillie Gifford funds and investment trusts. 45 of these funds sit within specific sectors and have at least 1-years performance history. Our analysis identified that a very impressive 51% have consistently been among the top performers in their relevant sectors. These funds have consistently performed better than 75% of their peer fund managers within their chosen fund sector.  Yodelar have awarded these funds a 5-star rating. Among the vast range of top performing Baillie Gifford funds available one of the most impressive was their Global Discovery Fund. This fund sits within the IA Global sector alongside 276 competing funds. Over the recent 12 months, it returned growth of 24.9%, higher than 99% of all other same sector funds. The sector average during this time period was 7.21%. Over a 5-year period it has been equally impressive, ranking 2nd in its sector with growth of 145.69%. Baillie Gifford also manages a range of 7 popular investment trusts, which combined hold over £10 billion of client funds. Our analysis of these trusts identified that all of them had delivered exceptional returns for their investors consistently over the recent 1, 3 & 5 year period. The largest of which is their Scottish Mortgage Investment Trust PLC which has more than £6.4 billion of client funds under management. Over the recent 12 months, this trust returned growth of 31.96% and over 5-years it returned exceptional returns of 192.81%. The Baillie Gifford Shin Nippon PLC investment trust was the best performer. Launched in 1985, this investment trust aims to achieve long-term capital growth principally through investment in small Japanese companies. The fund has continually excelled, over the recent 5-year period it has returned 301.75%. From their pension range, the Baillie Gifford Life Managed fund was the best performer. This fund has consistently been among the best funds in its sector, and over the recent 12 months, it returned growth of 10.42% and 67.5% over 5 years. To put this into perspective the sector average during these periods was 5.18% and 50.4% respectively. View the complete Baillie Gifford review 2018 in the March edition of the Yodelar magazine. Register now for just £1 for instant access to all premium reports. As identified in our analysis the significant majority of Baillie Gifford funds have excelled, making them one of the top fund managers. From the 38 funds under their management that have at least five years history, only 1 fund has regularly performed in the bottom quartile (worst 25%) within its sector - the Baillie Gifford British Smaller Companies fund. Over the recent 5 year period it returned growth of 69.63%, which on the surface may seem competitive but when compared to the sector average of 105.4%, it lags well behind. The debate as to whether Passive investing is better than Active continues to divide opinion. As an ‘Active’ fund manager, Baillie Gifford is very clear as to which process they believe is best and the strong performance of their funds supports their belief that ‘Active’ or ‘Actual’ investing as they call it, is a much more rewarding option for investors. In regards to active investing Baillie Gifford state on their website "Anything less is not investing." Despite this belief, Baillie Gifford have seen outflows averaging 10% per year from their range of pension funds as recent political and regulatory changes have switched investor focus towards costs instead of performance - which has resulted in more investors deviating towards lower cost passive funds. Although they may save on fees, the fact is passive funds cannot compete with top quality active funds when it comes to performance. The difference in growth between the 2 is so significant that any saving on fees is quickly dwarfed by the gains from top quality active funds. 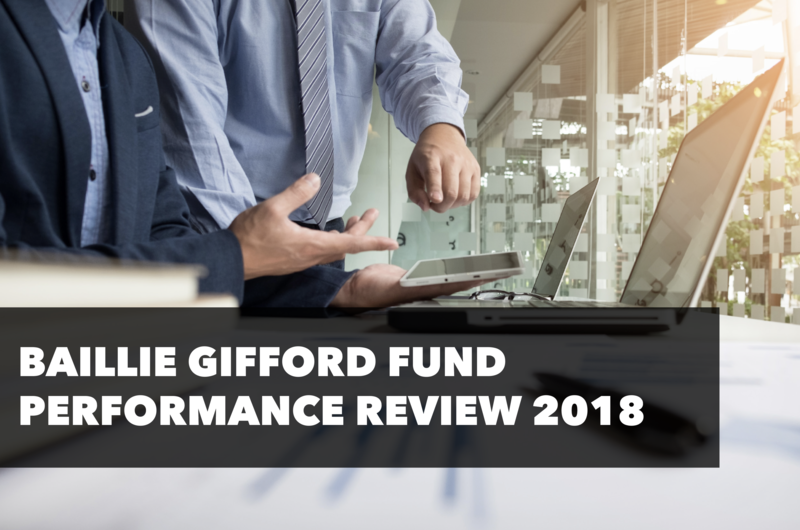 Download the full Baillie Gifford 2018 fund review, subscribe to Yodelar and access this review and 100s of other fund manager reviews instantly.